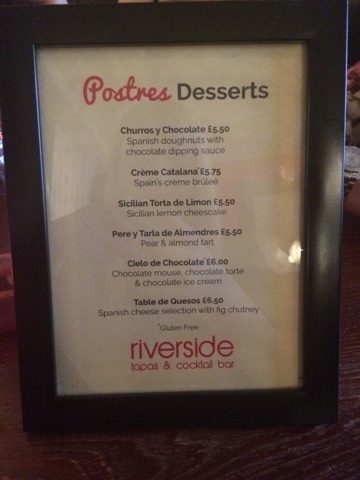 Riverside is a tapas & cocktail bar located along the seafront of Cleethorpes beach. We booked a table for 7 of us in the restaurant part of the bar located upstairs in the building. We had the place to ourselves and were shown to our table in a circular booth. 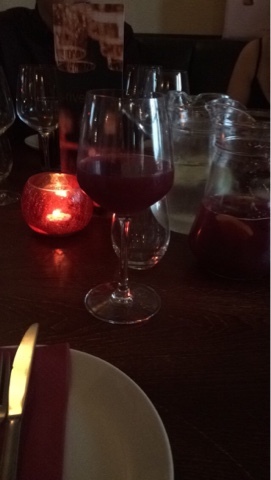 It was cosy with dim lighting and red tea-light candle holders. It was somewhat rustic and the sofa-like seating was very comforting. We had a friendly waiter, whom my step father nick-named Carlos (to get into the Spanish theme) who took our drinks orders sharpish. 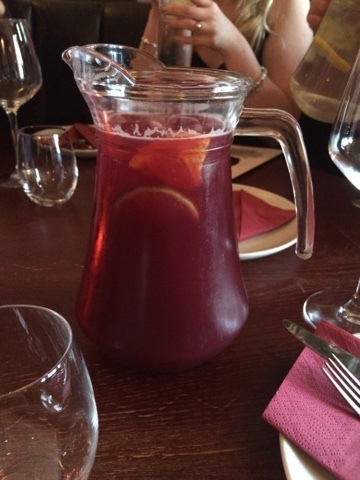 One member of our party questioned if there was a non-alcoholic sangria available however 'Carlos' returned to inform us that this was not possible, which was a shame and I definitely think that is something they could look into. There was an offer available for 6 tapas dishes and a jug of sangria for £35. And so splitting the offer, I chose 3 dishes for myself (doesn't sound like much, but trust me it's enough). With Riverside's generous portions, we were rolling out of the door. There was talk of dessert when the waiter gave us their menu but we just couldn't fit any more in. 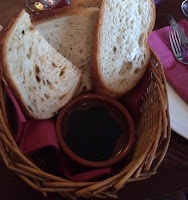 Whilst we decided what we were eating we were given 4 baskets of various types of bread and balsamic vinegar, it was hard not to fill up entirely on the bread as it was so good. Even those in my party who are not usually fond of balsamic vinegar seemed to wolf it down with ease. 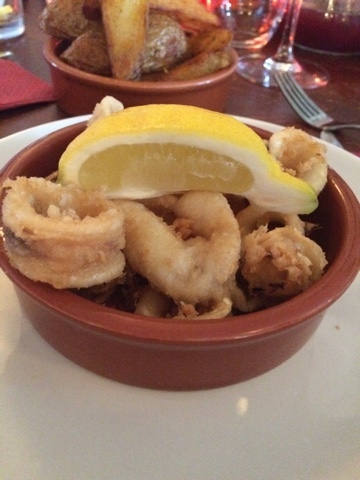 We finally cam to a decision with our orders and I personally went for the spicy chunky chips, deep fried squid and the salmon bruschetta, As a pescetarian, tapas could not be more ideal for me with it's with fish and seafood selections. Normally I am extremely limited in what I can eat when choosing a restaurant, there's only so many scampi bites a girl can take. Content with our drinks and food orders placed, I must admit there was a slightly longer wait that we had expected, but the bread was there to control our hunger. 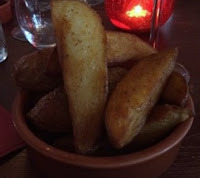 First to come out for me was 'Patatas Fritas Picantes' Spiced Chunky Chips individually sold at £2.75 per portion from the vegetarian option of Riverside's tapas menu. They were more like wedges if you ask me however they were really good. They weren't at all dry, and they were so soft. Sometimes when they're not cooked properly they can be a little hard but these weren't at all. 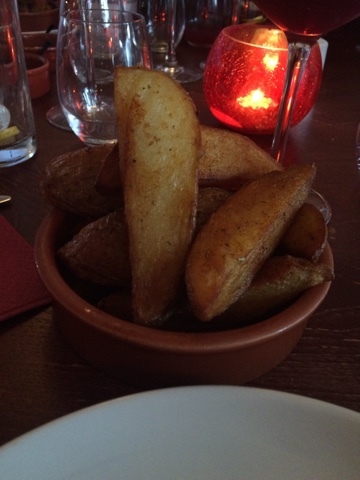 The potato was fluffy and I really enjoyed them. 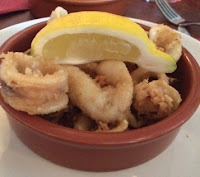 Next to arrive was my risqué choice of 'Calamares Fritos' Deep fried fresh squid individually sold at £4.75 per portion. I had only tried squid once before my visit to Riverside, Cleethorpes and that was at Wagamama's and I seemed to enjoy it and so I thought I'd try it again. It was very flavoursome however not too fishy if that makes any sense at all. Some times the taste of fish can be overpowering but it was rather subtle. It was quite tough and I found I had to chew a little before getting it down, but that's to be expected from squid anyway. My younger brother even tried it and enjoyed it too! I'm not sure I'd order it again on my next visit, simply because there are other things on their tapas menu that I'd love to try. Finally last to arrive was the 'Bruschetta' with smoked salmon, spinach and paprika mayonnaise individually sold at £3.75 per portion. 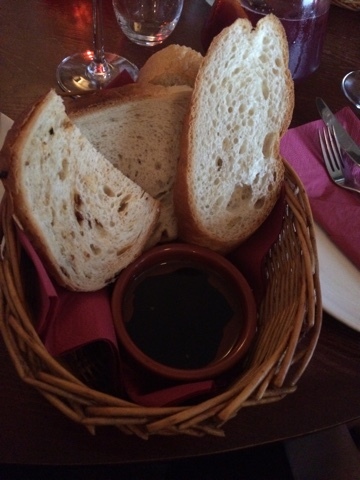 Each portion has two large bruschettas. I must admit I was very pleased with the portion size and I definitely enjoyed this dish the most. 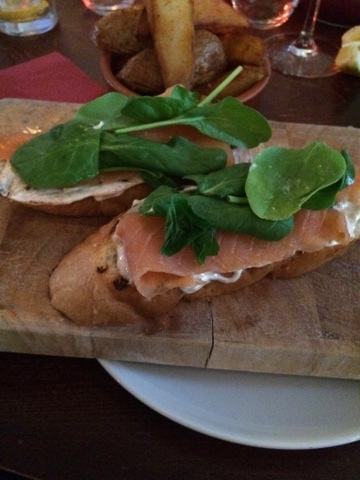 It was all very light and nicely presented on a rustic bread board. 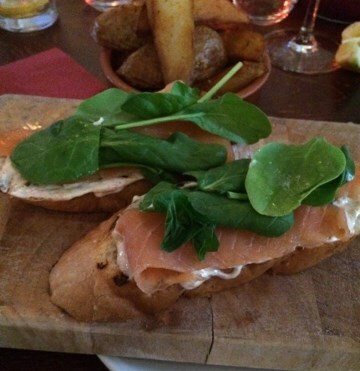 The paprika mayonnaise wasn't overtly strong which was nice, just enough so that you could taste the infusion of the paprika and the smoked salmon. And the bruschetta wasn't in any way heavy. 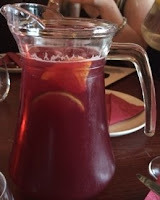 All three dishes together offered me a filling and enjoyable meal and with the jug of sangria to accompany those dishes made the visit to Riverside complete. I would definitely recommend it to my friends and family and feel as though I am already overdue a second visit. On our way out of the restaurant area 'Hasta la proxima' until next time is painted on the wall above the stairs. 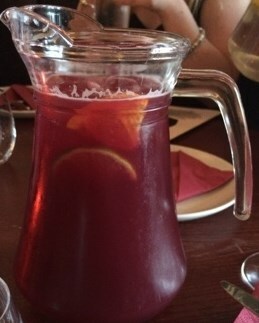 I will indefinitely return for another tapas and sangria experience at Riverside to try the many dishes they have to offer. 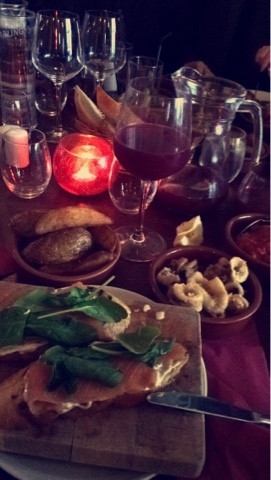 Find the full tapas menu here.